When I was a young and enthusiastic general surgeon in our hometown of El Dorado, my medical colleagues gave me several responsibilities reserved for the newest and most eager surgeon on the staff. One of these involved assisting several aging surgeons with their operative cases. One surgeon in particular, had been doing major operations for over 50 years, in spite of the fact that he was a general practitioner and was not certified by the American Board of Surgery. His eyesight was failing; he was quite shaky with his surgical technique, and I considered him a danger to the unsuspecting patients who had trusted him for years. On one occasion had I not been assisting him, his patient would have lost a significant amount of blood from a major blood vessel he had accidentally injured. The blood vessel was repaired and the patient had no complications. I resolved that I would voluntarily stop doing major surgery at a much younger age than this doctor, and certainly before I became shaky and unstable. Consequently when I was in my late 50’s in age, I began considering a transition out of general surgery yet still maintain an active practice in a different area of service. In 1997 a company with the expertise of establishing wound care clinics in hospitals, approached me about the opening such a clinic in El Dorado. In addition to providing medical treatment for the healing of chronic wounds, the clinic would also provide hyperbaric oxygen treatments to enhance the healing of certain types of wounds. I agreed to be the co-director of the clinic along with one of my surgical colleagues, Dr. Moses Menendez. I spent about 10-15% of my practice time in wound care with the idea that one day I would transition full-time into wound care and stop providing operative surgical care. When Cathy and I returned to Arkansas from Florida in 2000 following an 8 month adventure in opening a church-based medical clinic, we moved to Fayetteville to be near our daughter Ginny and her family. It was there I began a full-time wound care practice in the Washington Regional Wound Care Clinic. I was one of 4 medical directors of the clinic, but the other directors had active surgical practices, so they were more than happy to allow me the majority of working hours. The nursing director and founder of the clinic was Diane Gallagher, and she was the most knowledgeable wound care nurse I have ever met. I learned a great deal of practical treatment information from her and appreciated her compassionate care of our patients. One of the benefits I learned early concerning wound care, was that we saw our patients regularly and often. That gave me the opportunity to know each patient on a more personal level than with my surgical patients. In addition to their physical problems, patients would frequently open other problem areas of their lives, such as the emotional and occasionally the spiritual problems they suffered. This afforded me the opportunity to witness the healing power of the Lord Jesus, and to pray with the majority of our patients. I worked in the Washington Regional Wound Care Clinic for 5 years, and was offered the position of Director of Skaggs Wound Care Clinic in Branson, MO. in 2005, which I accepted. For Cathy and me, the main attraction to Branson was our daughter Mary Kay, her husband Dave Janke and their daughters, Rebecca and Sara Beth lived there. We moved to Branson in November 2005. Since I was the sole director of the Skaggs Clinic, I had much more freedom in the management of that clinic. Although it was not a requirement, all of the nurses and personnel of the Skaggs Clinic were committed Christians, and we considered our work there a ministry and not just medical employment. Prior to beginning my service, I asked and received permission from the hospital administrator, Bob Phillips to pray with those patients who desired prayer, and he consented. The staff of the clinic began each day with a brief devotion and prayer for our patients and for each other that we would serve our patients as the eyes, ears, and hands of Jesus. As a result, many doors of witness opportunity opened to us. It was not uncommon to witness someone praying to invite Jesus Christ into their life while being treated in our clinic. One particular patient who was referred with horrendous wounds of his feet as a result of diabetic complications, was in great emotional distress and fear of losing both his legs and his life. On his second clinic visit, he opened his heart to the saving power of Christ and prayed for forgiveness of his sins. There was great rejoicing by him, his wife and our entire staff that day! We treated him twice weekly for over a year, and although he required partial amputation of his feet; his legs were spared amputation. During each visit, we discussed many aspects of his spiritual growth and regularly prayed with him and for him. A physician in another town once asked me how I was able to adjust to the transition of having all the responsibilities of being an “important surgeon,” to just being assigned to “cutting toenails” in a wound clinic. I told him it was very easy because those toenails were attached to a very important person, and occasionally while cutting his toenails, he would allow me to witness to him. Most of my surgical patients were asleep under anesthesia while I was working on them! When Jesus was in the Upper Room with His disciples on the night before His crucifixion, He offered an example of how they were to serve others. The Bible says in John 13, “He rose from supper, laid aside his garments; took a towel and girded Himself. 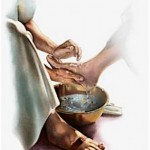 After He poured water in a basin, He washed the disciples feet and dried them with a towel.” Later in the account Jesus said, “If I your Lord and Master have washed your feet; you also ought to wash one another’s feet.” There is something very humbling to have someone sit and wash your feet. My Bubba mentored me for 25 years concerning our medical practices and the spiritual skill of foot washing. It was God who gave us the desire and the skills to practice medicine to the best of our abilities, and He also commissioned us to be witnesses for Him within the scope that practice. Whether a person needs his gall bladder removed or his feet washed and his toenails trimmed, he definitely needs the saving and healing power of the Lord Jesus. I have been honored for the past 40 years to be an agent for the administration of all of the above.